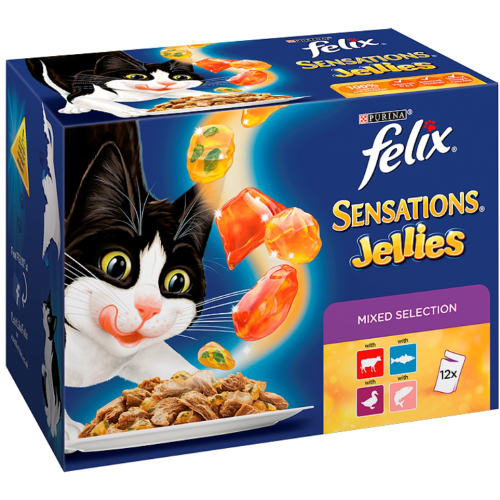 Felix Sensations consist of tender pieces for your cat to enjoy served with a delicious, and tasteful jellies for extra taste and an appetising aroma. 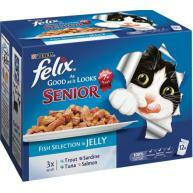 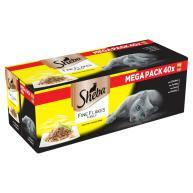 These Felix pouches are a great source of essential Omega 6 fatty acids, have the correct combination of balanced minerals and are rich in vitamin D and E.
With Beef in a Jelly with Tomato: Meat and Animal Derivatives (of which Beef 4%), Vegetable Protein Extracts, Vegetables (Jelly: 4% Tomato from Tomato Concentrate), Fish and Fish Derivatives, Minerals,Various Sugars. 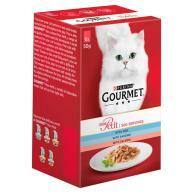 With Duck in a Jelly with Spinach: Meat and Animal Derivatives (of which Duck 4%), Vegetable Protein Extracts, Vegetables (Jelly: 4% Spinach from Dehydrated Spinach), Fish and Fish Derivatives, Minerals, Various Sugars. 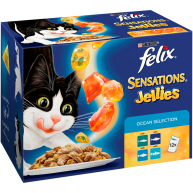 With Salmon in a Jelly flavoured with Shrimp: Meat and Animal Derivatives, Vegetable Protein Extracts, Fish and Fish Derivatives (Salmon 4%), Molluscs and Crustaceans (Shrimp 1%), Minerals, Various Sugars.